I’ve mentioned in earlier posts that Benedict Arnold fascinates me. As I move around in our part of the Hudson Valley I often come across things and places that touch on his story. Yesterday I went with a friend (another Brit) to Peekskill, NY. We’d been threatening to try out a local British/Irish style pub: The Quiet Man. Unfortunately, it was closed because of a leaking sprinkler. No problem. There’s another place that serves British food and beer just across the road McDonald & Peacock Cider House. So off we went only to find a sign on the door indicating that they were closed all of February for vacation. Eventually we ended up at a 1939 vintage diner: the Center Diner. It was pleasant enough but I’d been looking forward to some English food and a couple of beers. Arnold attempted to betray Hudson Valley forts, soldiers and supplies to British forces in collusion with John Andre, an English officer. Peekskill was the first Continental Army regional center for military operations, with headquarters at the former Birdsall House. 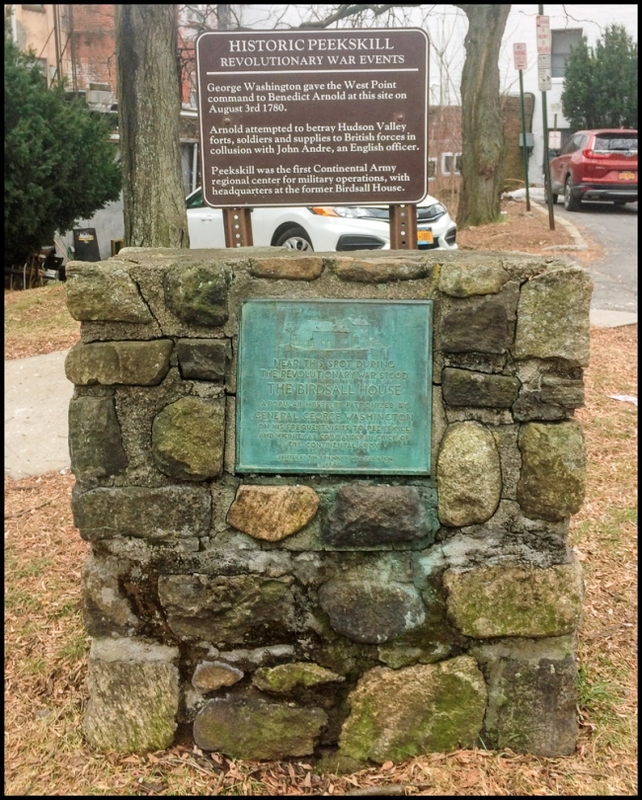 Near this spot during the revolutionary war stood THE BIRDSALL HOUSE, a popular hostelry patronized by GENERAL GEORGE WASHINGTON on his frequent visits to Peekskill and vicinity as Commander in Chief of the Continental Army. The Birdsall house, Washington’s headquarters at Peekskill, has been gone for many years. It stood on the southwest corner of Main and Division Streets, a frame building, erected by Daniel Birdsall, shortly after the founding of the present village in 1764. After his death, which took place October 29, 1800, it was occupied by his son for more than half a century, during which time the interior arrangements of the house remained unchanged. After his death the house was torn down. Although the original is long gone, in the vicinity of where it stood now stands a modern restaurant called the “Birdsall House“. It has a good collection of craft beers. Had I known I would have gone there instead of the diner. Taken with an iphone 5s.